Datron’s Spectre V® radios offer secure communications in ruggedized form-factors, provide a sophisticated feature-set, and utilize a simplified user interface for ease of operator training. The PRC2100V is a high performance, competitively priced, tactical manpack radio that features embedded ECCM, COMSEC, and GPS capabilities. 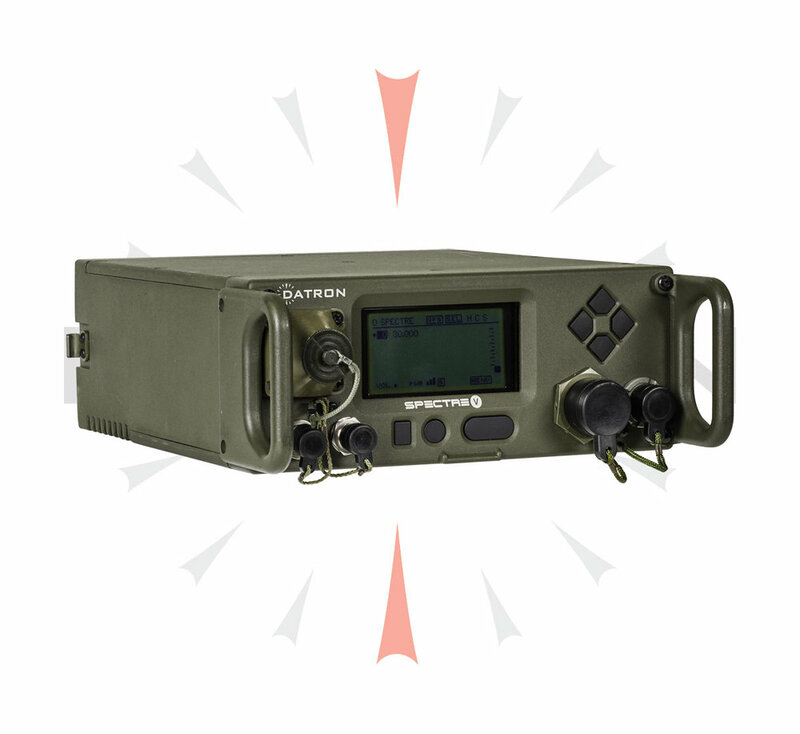 It is designed to satisfy the demanding needs of today’s sophisticated tactical communications arena and is available as either a 10W manpack or a 75W mobile or fixed station system. It meets MIL-STD-810 for reliable operation in harsh environments in any configuration. Excellent dynamic range lets co-located units transmit and receive simultaneously on the same vehicle without diminished performance. Status messages are shown on the PRC2100V’s large graphic display. Menu screens in the language of the operator offers a new level of operating comfort for the user. Accurate position and time-of-day capability is afforded by the embedded GPS receiver. Full- or partial-band frequency hopping and digital encryption waveforms offer a high level of jamming resistance and security encryption for both voice and data transmissions. As part of the complete line of Spectre V radio solutions, the PRC2100V is fully interoperable in all encryption and hopping modes with the HH2100V handheld radio. The PRC2100V can be used in a network to provide base station, vehicle, manpack, or retransmit capabilities. The PRC2100V has excellent distance coverage, due to its sensitive and high dynamic range receiver, its finely tuned internal antenna matching network, and its many variable output power settings (from 500mW to 75W). High power settings can be used when maximum range is desired, while lower power settings can be used to save battery life or when low probability of intercept is a mission requirement.